Mmmm, beer…Brewing is not only my career, but also my passion. After graduating LSU with a degree in English I feared my career was destined to consist of one service industry job after another. It was not until I discovered Tin Roof that I found a love for brewing as a profession. Tin Roof Gave me an opportunity to get my foot in the door and a chance to learn the art and science of making beer. Much of what I know about brewing I have learned through my time here and I can honestly say I think I have found my calling. After more than three years working my way up the ladder, hungry for knowledge, I decided to move back home to Dallas and find a job at one of the many craft breweries in the area. I was lucky to receive an offer I couldn’t refuse from one of my favorite local spots—Deep Ellum Brewing Co. and jumped at the chance. I have always been drawn to Deep Ellum because of their beers and their culture. I was excited to make the move and see what I could learn from a bigger brewery in a much larger craft beer market. Enter the graveyard shift, those who have worked graveyards can sympathize with me here, but after several months of a completely flip-flopped lifestyle, I was ready for another change. 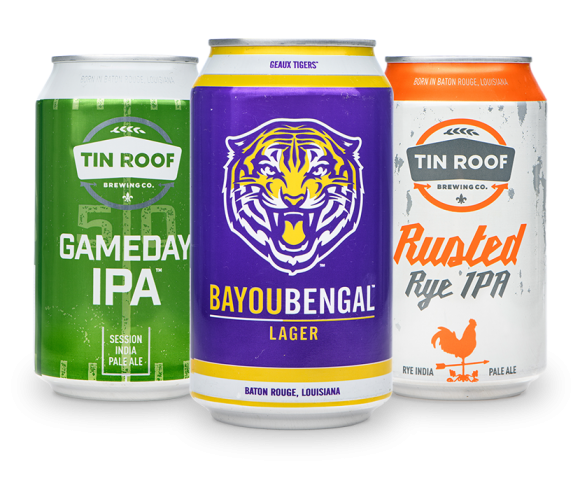 Back in Louisiana, Tin Roof was implementing some changes that promised a new and excited opportunity for craft beer in the state. Exciting enough to make me want to return and pick up where I left off. After living in Baton Rouge for as long as I have, I have come to love the culture of South Louisiana and consider Tin Roof family; so, it wasn’t hard for me to make the move back. The new Tin Roof has given me the opportunity to explore my creativity in brewing as well as continuing my education on brewing. The new Juke Joint, Rusted Rye and upcoming re-vamped Voodoo have tickled my inner hophead and I am so excited to be involved in the process of developing these recipes. I am truly grateful for the opportunity and family that Tin Roof has given me and look forward to continuing to brew great beer for Baton Rouge and people all over the South. The prodigal brewer has returned home.